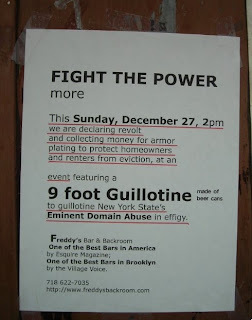 Last week the staffers and regulars at Freddy's Bar & Backroom, slated to be demolished for the Atlantic Yards arena, installed "chains of justice" so resisters can handcuff themselves to the bar to protest the anticipated eviction. 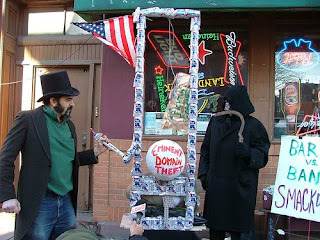 This week came another media event, the guillotine, a creative structure made out of Pabst beer cans, used to execute an effigy representing "eminent domain theft." And yes, the media came out--far more than at some of the important legal arguments or governmental meetings. Everybody loves a good metaphor. At left above, executioner Steve de Sève (producer of video at Freddy's Brooklyn Roundhouse) and Death, portrayed by Elliot Crown, in action. I shot a brief video of O'Finn answering press questions, in this segment mainly from Stephen Witt of the Courier-Life chain. Witt asked if O'Finn had asked for a spot in the Atlantic Yards project for the bar--kind of a non sequitur, given that sports facilities don't accommodate quirky bars like Freddy's. "We're not so great at getting a lot of money, we're great at getting local talent," O'Finn responded, noting that artists from all over the world want to perform at the bar. "Why not in this massive project, why don't you try to give back to the community, letting us do what we do," he said, suggesting a community center with day care (the latter is actually planned), free legal aid, studios for artists, and an art gallery--all rather antithetical to the corporate plans for the project. Witt pointed out that Freddy's is a for-profit operation. "We're $2.75 a Pabst, we're not ripping anybody off," O'Finn responsed. "We don't have a cover charge, no drink minimum, nobody's getting rich here." 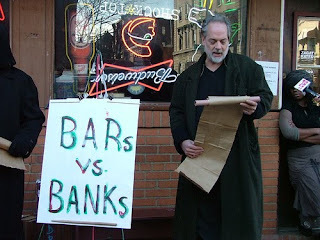 And moving the bar, he said, would be tough, given the prices of real estate. Freddy's operates in a building owned by Forest City Ratner but has two years left on its lease, which is why the state would use eminent domain to move Freddy's out.